I have waited a while to begin this post since I don't know quite how to wrap it up in one story. So, I have decided to start from the very beginning. We were looking for a trip when the weather would be pleasant, the accommodations excellent, the food superb and the sights exquisite. We chose a Tauck Cruising experience from Holland to Belgium in the Spring by small ship. We have traveled with Tauck before and knew that this adventure would be topnotch! Tauck tours are of the highest quality and include the very best of tour directors. There were three tour guides with us on this trip and each was an expert! We began in Amsterdam. The architecture of this city combined with the canals makes it very intriguing. 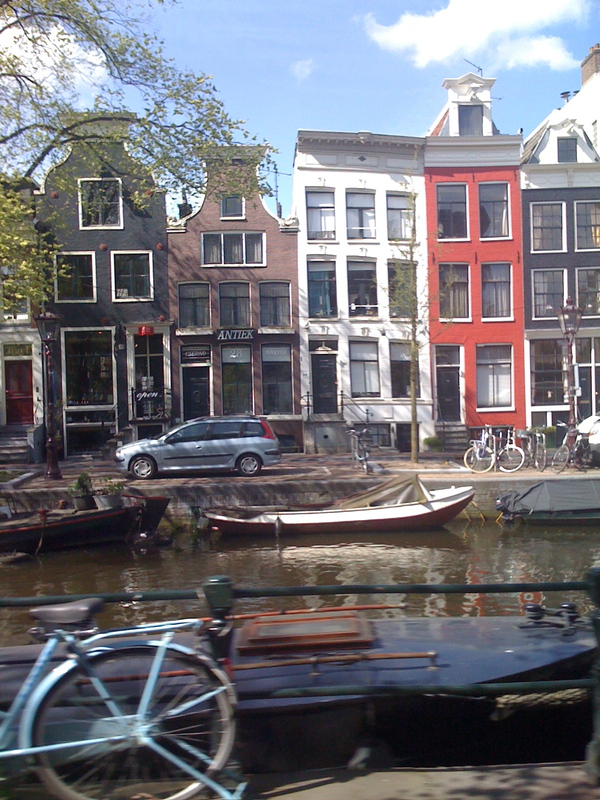 Our first impressions were of the bicycles, old houses, canals and houseboats. We booked an extra night at the Sofitel Grand Hotel in order to have some extra time. 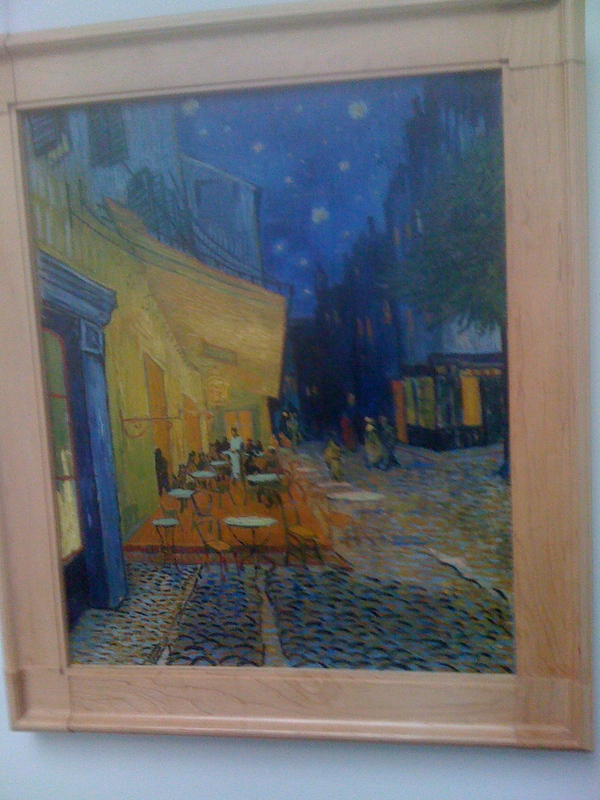 Our goal was to visit the Van Gogh Museum since this museum was not on our itinerary. The collection is so vast that a tour could take several days to see it all, so I understand why it is not included. After riding the streetcar and walking a short distance, we were there! A history of Van Gogh art was laid before us as we never could have imagined. No photos were allowed, but there were pencil sketches, letters to his brother and world famous paintings we had never seen before. It was well worth the extra time. We enjoyed the street cafes of Amsterdam, but were warned to stay out of the coffee shops, unless our intent was to purchase the legal soft drugs! I don't believe that John ventured to the "red light" district after I was tucked in and sound asleep. He said, not, but he did have the opportunity had he been so inclined. That, too, is legal. Our riverboat was the Swiss Jewel. It was very lavish and the passengers numbered 109. This allowed us to get to know many of them very well and we hope to keep up with them through Facebook and emails. Tauck made sure that our food, drink and activities were the best! This trip was all inclusive for the most part and we were so relieved not to be "tipping" every time we had a guided city tour or an extra cocktail! Another perk of riverboat travel is that you can unpack once and you are set for the remainder of your vacation time. I even had a massage onboard one afternoon after some rigorous walking. What an effortless way to travel! 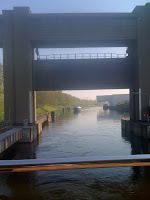 We steadily cruised several waterways and canals including the Maas, Rhine and the Albert Canal. 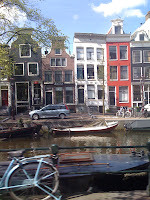 While in Amsterdam, we had a city tour via canal boat and saw the "Night Watch" by Rembrandt at the Rijksmuseum. But the highlight of this part of our tour was Keukenhof Gardens in Lisse. There we saw the blooming tulips. We literally saw millions of these blossoms! In addition to the tulips, there were pavilions scattered around the 56 acres of plantings and each highlighted a different theme or flower. Flowers are big business in Holland they supply over 80 percent of the cut flowers sold in the world. Seeing the tulip fields from atop a windmill will be an image imprinted in my mind forever. In this picture, the stripes of color are tulips! Magnificient!! And the weather on this day was "bluebird perfect." 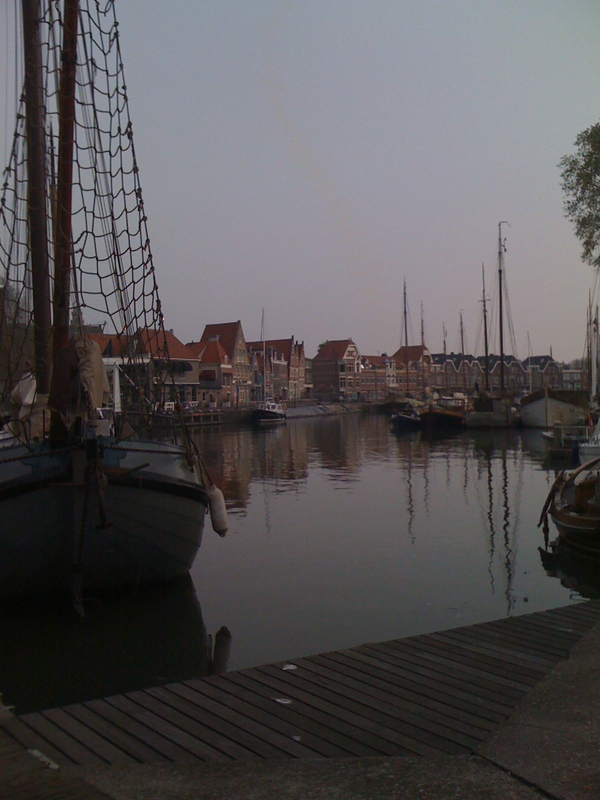 Next stop was Hoorn which is an ancient (centuries old) fishing town. We had a walking tour of this area and learned about the trading centers of Holland, much of which was based on fishing. Some of this trade ended with the process of damming the North Sea which in the past regularly inundated the area. In the afternoon we visited the Enkhuizen Zuiderzee Museum which featured costumed characters to tell the story of Holland of old times. The buildings of the museum were transported there and reconstructed in their authentic manner. In America, there are some historic buildings but nothing compares to the old buildings we saw in Holland. On another day we saw more famous paintings in the Kroller-Muller Museum with the De Hoge Veluwe National Park. The park is a nature reserve and was donated along with the art by Helen Kroller in 1939. 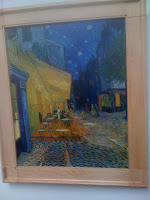 This art from her personal collection included more Van Goghs and other masters such as Picasso. There is also an outside sculpture garden on the site. The original of "Cafe Terrace at Night" is housed in the museum. Very impressive, indeed! Maastricht was another city of interest. A walking tour included seeing more ancient buildings and experiencing the casual ambience of this busy place. All over Holland, one must watch out for bicyclists and it was not different in Maastricht. The Swiss Jewel provided bicycles for those who wanted to venture out on two wheels. That evening we dined "off the boat" with some fellow travelers with whom we had a great camaraderie. Turns out that they were both natives of our city! Can you imagine going half-way around the world to meet folks who live in your home town! Indonesian food was on the menu and we thoroughly enjoyed an authentic Rice Table dinner! A rather solemn occasion was walking the hallowed grounds of the Netherlands American Cemetery which is the burial place for over 8,000 World War II soldiers. Many of these soldiers were lost during the semi-successful "Operation Market Garden" of WWII fame. Each grave has been "adopted" by a local resident family who makes sure that their "soldier" is visited and thanked for his service to our and their country. They appreciate their freedom very much and appreciate Americans for helping to preserve that freedom. President Reagan visited this site on the 60th year of its existence and the plaques and statues paid tribute to that visit. Antwerp was on our itinerary. Following a quick city bus tour, we embarked on a rather ambitious walking tour of Antwerp. We saw chocolate in the making, the Peter Paul Rubens House and the very old Guild Houses. Our walking tour ended with a lunch in town. The weather turned extremely warm that day, so we were a little exhausted after this busy morning. Rubens is best known for his work that is housed in Italy, but his home was in Antwerp. Visiting his studio, we learned that he outlined many of his paintings and had apprentices to finish them. He was a successful artist who actually sold many of his paintings during his lifetime. Then...on to Belgium. The Swiss Jewel negotiated the Albert Canal and we sat on the top deck as our tour guide entertained us with stories of the building of the canal. We were also warned to "duck" as we went under low bridges. The wheelhouse of the boat was lowered for these occasions. 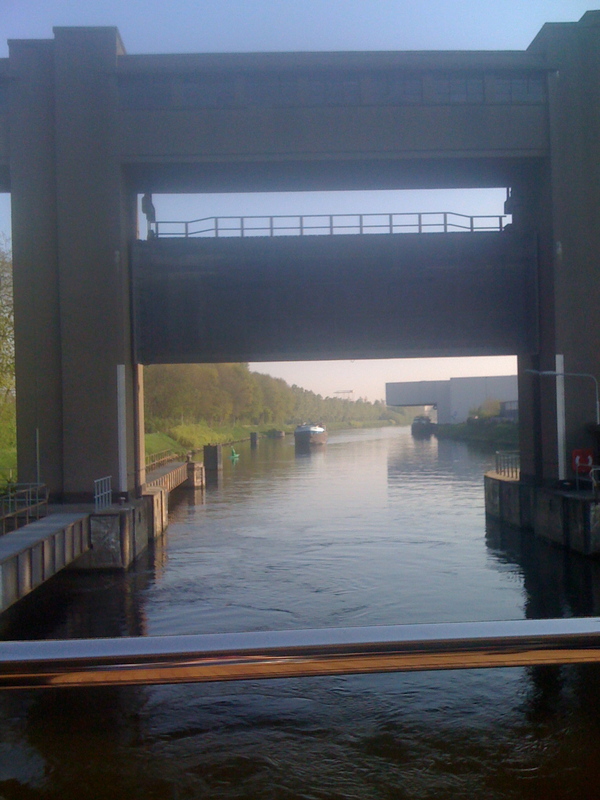 On the duration of the voyage we passed through no less than 26 locks and bridges. All of these were for the control of water levels. Holland is below sea level and they are constantly fighting water. Once in Belgium we left our beautiful Swiss Jewel and its wonderful crew and headed to Bruges! 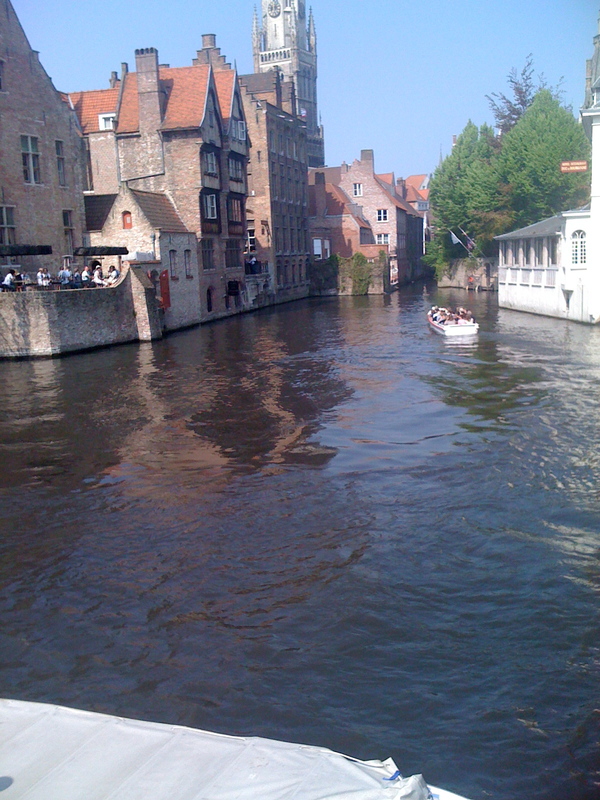 Bruges is the "Venice of Northern Europe" and canals encircle the old part of the city. It remained untouched by the Nazis in World War II because it was not an industrial city. The main products produced there include lace and chocolates and the enemy did not find these items strategic threats. Bruges is a tourist city and again we had to be very careful of the bicycles. Getting hit by a bicyclist is a constant threat to pedestrians! We were able to view the second century buildings and had we been physically able, could have climbed their famous tower. The lines were too long to enjoy a canal boat ride, so we have to return there to do that. We did, however, try some Belgian Waffles. We asked for the ones with the least sugar and the waitress laughed out loud! Our last night was dinner on our own in Brussels. We stayed in the Amigo Hotel and it is only steps from the Grand Place. This evening was marred by a little rain, but we were unstoppable! We walked along a busy street and were "pulled" inside street cafes promising free drinks and appetizers if we selected their establishments. We felt as though we were on Bourbon Street in New Orleans being pulled into strip clubs! We did select a restaurant and had great paella with fresh mussels and lots of other seafood. So...we had mussels in Brussels! Next day was home! I love traveling, but there is no place like the good ole USA! In this post, I pointed out the highlights of the trip. There were many more interesting things that we saw or experienced, but space prohibits them from all being shared. I didn't even mention the beautiful cathedrals and basilicas we entered or the great cuisine we enjoyed. Needless to say, we need to go back. I am now spending my daydreaming time perusing www.Tauck.com to plan for our next adventure! Must mention that we now adore eating "stroopwafels". Goggle them and you will see why. Here is a hint: waffle cookies pasted together by caramel. Need I say more? What a great post! I felt like I was there with you as I read all the wonderful descriptions. I am glad you had a good time!